How to Lean In in High School? Overcome the Fear of Missing Out. Many teens hold themselves back for fear of "missing out." 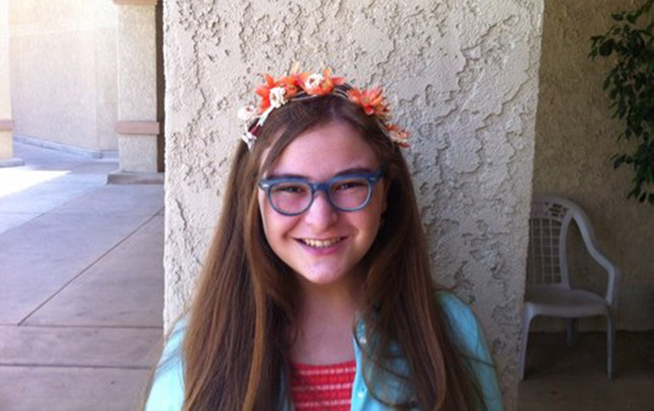 Alexandra Kukoff, 15, shares her story. How to overcome FOMO? Lean In, says Alexandra Kukoff. Photo by Jing Qu. When I was in the seventh grade, one of my teachers frequently liked to assign us group projects. Because the class slackers and I had one thing in common—the first letter of our last names—we were constantly placed in groups together. For a lot of girls my age, “missing out” is a common fear. It’s not that academics are less of a priority, but at the end of the day -- especially in high school -- girls are more concerned with being liked than seizing opportunities. Particularly since headstrong women who look to lead and excel aren’t regarded in the kindest light, “missing out” on recess or a party is even more consequential. I was born deaf in my left ear. I was never eligible for a hearing aid because the origin of my deafness was a lack of two of the three essential bones for hearing, and because I couldn’t hear, it was hard to make friends—I only had a couple of close ones and never had a group I regularly traveled with. Never had I felt this fear of missing out so acutely than the summer before my freshman year of high school, when I was deciding whether to attend college early. It was an exciting opportunity -- I’d be doing high school and college curriculum simultaneously—but, I’d be sacrificing my high school experience: pep-rallies, late-night SAT studying, dreaming about the quarterback on the football team, senior pranks, and of course, prom. But to me, these seemed like scenarios that existed only in the realm of late-90s teen movies. I knew that the kind of community I’d flourish in to become more outgoing and self-confident was an academic one, and college was the perfect place to find such a community. I didn’t give into my fear of missing out and instead “leaned in.” Today, I’m set to enter my sophomore year of high school and college, and am working towards my associate’s degree in Women’s History. I became more outgoing, making close friends and getting involved at the college’s Honors Club, and, so far, have had a better experience than attending high school alone would have entailed. I am also working with an organization called GrabCAD, an open forum for engineers, to develop an idea for movie-theater glasses that, through display captioning, will help the hard-of-hearing. Over the last six months, we've developed a prototype of the glasses that we’ll soon be crowd-funding. I "leaned in," but I’m worried that because of this fear of “missing out,” many girls tend to hang back. They get good grades, but don’t seize long-term opportunities. They conform to the norms set forth by peer pressure. The result? Over time, they begin to lose faith in themselves.